Up the road from Salvation Mountain, miles from anywhere. A half-buried bus named Walter greets visitors to East Jesus, a self-sustaining art community in the Southern California desert. Overlooking the Salton Sea in the shadow of mature Ironwood trees rests a man still much loved. The former “mayor” of East Jesus, a fenced community of free-roaming, ever-rotating artists, musicians, scientists and builders located on the far western edge of Slab City, Charlie Russell rests in peace. Memorial to Charles Russell (aka "Container Charlie"), founder of East Jesus. Slab City, just north of Leonard Knight's painted tribute to love – Salvation Mountain – is what’s become of Camp Dunlap, a 630-acre decommissioned World War II naval auxiliary air station north of El Centro. (Editor's note: Leonard Knight passed away last February.) Built in the 1940s along the banks of California’s largest lake and not far from the Chocolate Mountain Aerial Gunnery Range, the concrete slabs and subterranean bunkers are all that remain of the artillery training facility that once housed more than 185,000 Marines at its height of operation. The 30 buildings were officially deconstructed in ‘59 and the land was conveyed to the State via a quitclaim deed that did not, interestingly enough, include any restrictions, restoration provisions or even a recapture clause. Consequently, squatters have taken up residence on the abandoned property and although the Border Patrol cruises by frequently, government agencies turn a blind eye. And have been for more than fifty years. Self proclaimed to be the last free place in the U.S., the Slabs made famous by Sean Penn’s Into the Wild is now a fairly structured community of “survivalists” and retirees, some living on hefty federal pensions. It has neighborhoods like any other, a pub/club/theater, a newspaper, a church and libraries. Although it does still have street signs posted, there are no public facilities or services. 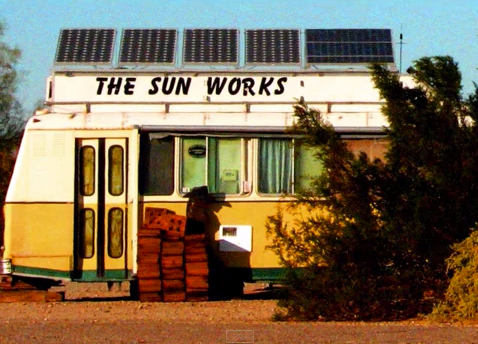 Folks use a natural hot spring pool down the street for bathing or rig makeshift solar showers if they aren’t living in self-contained units (RVs). However, as inventive as people can become when living “off the grid,” it requires a bit more than innovation to retain the overall health of an environment. Without solid waste disposal services, “slabbers” must either seriously rethink their lifestyles, and thereby their consumer habits, or devise methods of recycling and reusing their trash. Otherwise, the heap of refuse grows and all the problems associated with landfills develop. As with any neighborhood, some people are conscientious, responsible, and responsive – others are not. Yet if Mark Boyle, the former businessman turned freeconomist, the“Moneyless Man,” can do it without leaving a trail of trash in his wake, then others consciously choosing to live off the grid and on land not served by public utilities should be able to do the same. Burning Man pieces like the Definition of a Grievance have found a home at East Jesus's Art Garden. Intended originally as experimental, the village that sits 75 feet above sea level right smack on top of the San Andreas fault line has grown around Russell’s repurposed shipping container to become a habitable cooperative compound with numerous structures, a large open-air well stocked kitchen, comfortable living room, library and music room complete with a functioning tuned grand piano. Container Charlie, as he became known, chose the site because it was on the outskirts of Slab City, had trees for the shade that would prove vital in summer heat that exceeds 110 degrees, and held a commanding view of the Salton Sea. Residents have since installed solar power, restroom facilities, hot showers and small vegetable planters watered with grey water within the glass bottle walls shielding their abode from the ferocious winds. They have plans to increase their self-sufficiency by building and stocking a chicken coop and maintaining aquaponic gardens. The community, like the expansive sculpture garden that surrounds the compound, is – as the gateway sign reads – a continual work in progress. There is a sundial made from triangular pieces of oxidized galvanized steel and hammocks are strung everywhere beneath the canopy of shade. I took this fact alone as a clear sign of occupant intelligence. Mirrored crosses and colored strands of beads hanging from the branches above reflect the shards of sunlight lending zen-appeal to the otherwise inhospitable surroundings amidst the harsh Colorado Desert. Constructed entirely of salvaged refuse and recycled materials by wandering “geniuses” and barefoot “messiahs”, by the dispossessed and repossessed, by sun seeking snowbirds, hippies yearning for simplicity, retired yuppies looking to stretch their well earned dollars and every genre in between, East Jesus’ sculpture garden alone is worth the detour off Highway 111 that runs north towards Palm Springs. A few relics of Burning Man have been salvaged and reconstructed here. Ty Johnson’s Can Organ that must sound incredible during the monsoons; California Institute of the Arts student Joe Holiday’s phenomenal Definition of a Grievance, a mammoth made from blown-out tires; the Tower of Barbella and Windmill Bicycle Wheel inspired by Prescott, AZ, sculptor/painter Royce Carlson; and Fame Retardant, a buried house piece constructed from scrap wood by Detroit and New Orleans influenced artists, Ben Wolf and Heidi Tillmann. When the setting sun shines through cancer survivor/master chef/vagabond Frank Redford’s bottle wall with arched entry, it’s difficult to walk away. Russell's mobile home/bar/workspace, Cinnabar Charm. Functional art pieces are included in the collection, beginning foremost with Russell’s very own Cinnabar Charm, his naked mobile where he’d lure willing females in for, among other things, a chocolate martini. Specializing in assemblage art, his red ‘71 Westie bedecked with roof-mounted photovoltaics is almost entirely decorated with waste items. It served not only as his bar, but also his home office, taking him across the country to job sites and personal adventures. Another vehicle of note is the gutted and charred Carbecue, used primarily to “burn stuff” and broil anything from patties to pigs. There are no local municipal laws governing the citizens at the Slabs, since it isn't officially an incorporated city. There are, however, guiding principles that slabbers are expected to adhere to. Two actually, both of which are exactly what you’d expect from such a socio-economic experiment: 1) Do no harm as you 2) do what you wish. Easier said than done as history can attest, and with any community, Slab City, too, has its share of dirty laundry. Crime is universally considered high taboo, especially in a free society founded on mutual respect by people aiming to assist each other in order to survive. Violence, it should be noted – though it, like robbery, has reared its ugly head – is virtually unheard of here. Nonetheless, self-preserving humans take reasonable measures, even at the remote Slabs. It is little surprise, then, that space delineating-stuff safeguarding fences have been erected, improvised alarm systems installed, and territorial signs erected on the perimeter that read: “DANGER: Armed and Bitter Libertarian Drunkards Live Here – Trespassers Will Be Used for Target Practice”. Russell’s artistic legacy, the East Jesus Sculpture Garden and Zen Center, is open sunrise to sunset year-round and admission is free, although donations are appreciated. (Slabbers, being non–property tax paying squatters, aren’t legally able to charge for any service/product provided, including those provided every weekend at the local watering hole aptly called The Range). Check out the East Jesus website to learn more and donate to East Jesus's Land Purchase fund. Volunteer participants are sought to assist with a wide span of projects, including the expansion of the sculpture garden. Those interested in exchanging labor, materials and/or expertise for food and shelter may contact them at [email protected]. March 24, 2015 @ 1:05 p.m.
Nick Williams, thanks for reading. I went a few times, between 2011 and 2013 and had a blast each time. I didn't really see much difference in the mix of residents than what you'd find in most city neighborhoods. So, perhaps it has changed since you last visited. It's not a posh place by any measure, as I'm sure you'll recall. Rough around the edged in just about every way. But, then, I think the residents would say that's part of why they like it. The lifestyle, obviously, isn't for everyone. April 3, 2015 @ 9:28 a.m.
Jenn Nelson, thanks for the links--good information. April 4, 2015 @ 4:21 p.m.